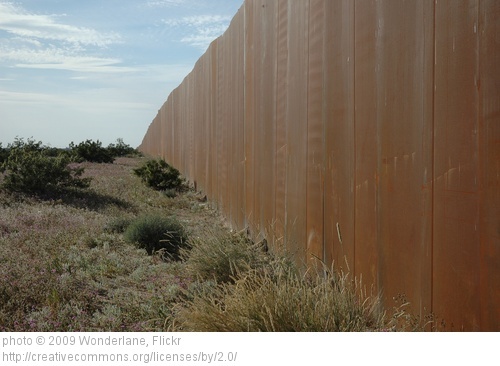 Border wall, Sonora Desert–Mexico side. When I was in Phoenix this summer for our national Mennonite Church USA convention, I had the privilege of going on a border trip with Borderlinks. I learned about the good work of organizations like Southside Worker Center and Scholarships A-Z. I witnessed a Streamline trial and learned a little bit about the devastating effects of our immigration policies on people and the environment. This Sunday, I will have a chance to share some of my experience during worship. Here is the call to worship we will use–taken in part from a previously-posted immigration prayer. We have come from different places and gathered here, today. The One who sent Joseph and Mary and Jesus to a foreign country, because their homeland was not safe. The God who calls us to love and care for the strangers among us. The strangers who have come to this country fleeing danger and despair. The strangers who have come to this country seeking family, freedom, and work. The strangers who may not look like us or speak like us, but are, like us, created in the Divine image. May our worship create a space of love and hospitality for all. I was at Phoenix, too, and did a BorderLinks trip on Thurs., July 4, which highly impacted me. Our local CUNA (Congregations United for Neighborhood Action) is actively involved with immigration reform and helping undocumented people get their documents. I will be more involved with this as a result of my time in Tucson/Nogales. Thanks for sharing! Wish I could have met you in Phoenix. Carolyn, yes, those borderlinks trips are amazing. I just posted another piece about my trip. I assume you didn’t get to attend a Streamline hearing since the courts were closed on July 4. So sad. Blessings to you and the CUNA in your work with immigration reform.